NEW UPDATE 02/08/10: Please, read this post from Ajaxian. IMPORTANT UPDATE: Dion Almaer (the author of the post in Ajaxian) has personally apologized as you can see in the comments below. Now I’m happy again. :) Resentment is over. Thanks Dion. In the last days I’ve been - and I am - really disappointed by Ajaxian’s lack of netiquette with me. 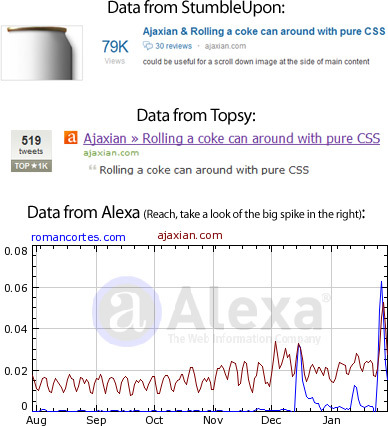 They hotlinked the iframe of my lastest CSS experiment (the Coke can) without permission (and this is the second time they hotlink my job that way), stealing this way my bandwidth and my visitors. After I complained, they have not yet directly contacted me about it. Well, first, what is Ajaxian? Maybe you already know it: it is a well-known, high traffic website that is usually considered a good source for web developing news and techniques. On December, they hotlinked the effect iframe of my CSS Meninas post. They did it without even asking me, so I wrote a comment in their post asking them to write to me back. They didn’t. I have a little rented dedicated server, and it is very limited in monthly bandwidth, cpu time and bandwidth per second. When a high traffic site like Ajaxian hotlinks me, my server starts to work to its limits, and that can easily make it go down, or I can reach my maximum allowed bandwidth. In the case of December, fortunately the server resisted that and I had no downtimes, so I just let it go and tried to forget the unrespectful/careless act from Ajaxian. 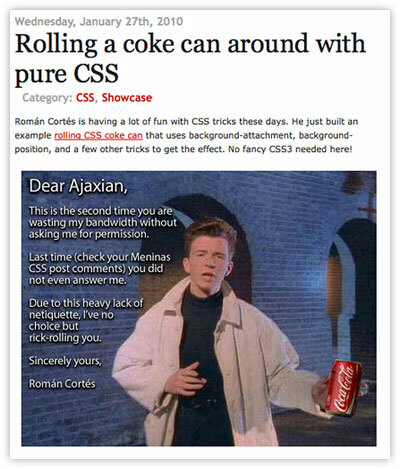 About a week ago I published the Coke can effect. Its popularity has been astounding: so much that in the first days it went, at the same time, to the frontpage of several big social news and aggregators websites. This made on January 26 my server to have hours of downtime. On January 27, Ajaxian, again, hotlinked my content without my permission. Even if they linked me as author - and this is probably, the only correct thing they did -, since the post contained the full working effect, it was not clear enough to the users that they were not the authors of it. As a result, Smashing Magazine (probably the biggest and more important website on web design, with over 100k Twitter followers) twitted them for the effect instead of me. Also, people voted for it on StumbledUpon, getting it in the frontpage (as writing, it is in the frontpage yet, with 79k views) and re-tweeted it until making it the most twitted post of Ajaxian. All of these made them get the visitors while stealing my bandwidth. Not only that, but since the effect could be seen directly from their page, even the users who understood it was my job and not theirs did not visited my site because they had seen the effect already. This is why I think this is a way of stealing visitors too. As you can see, my work doubled their traffic in the lastest days… in an already high traffic website (the Romancortes effect I might call it). I’m mostly concerned with my bandwidth and my server stability, but, the thing is: they steal my bandwidth without permission or asking me, they steal visitors that should be mine and not theirs AND they show advertisements in their website. Since I doubled their visitors in these days with my original work and my bandwidth, should I think that they are, in fact, making money at my expenses? Please, don’t think I’m a pro-copyright activist or something like that; I’m not. In the 99% of the cases, if you ask for permission to hotlink, or copy my content, or use my artworks or whatever, I will give it to you. But in this case, I think this has been just too much. Hoping to receive a personal answer from them, I rick-rolled them. It was easy; since there were an iframe in their page pointing to the effect in my server, I had just to change content in my server. I did it in a friendly way, with some humor and trying to get their attention so they write a personal message to me. But nothing. No answer yet. They changed their post to avoid the rick-rolling and added this line: “[Edit: Fixed the hotlinking - well played Román - he Rick-rolled Us]”. That line is, in fact, for their users, but not a personal message to me. I’m thinking… how hard it could be to contact me with a personal message? Finally, and as a conclusion, just to say that the lack of netiquette is, in fact, a lack of etiquette. The Internet medium makes the things to look ethereal as if there were not people involved there. But, we are involved, and we are people. If you do something not correct to a person in real life and the person complains, you usually will say “sorry”. Why not to do the same if the person is from Internet? Also, I believe big sites should take even more care with this. Since they are the most visited, they should try to be good examples on that. Unfortunately, it looks that it is not always this way. why don’t you just disable hot linking? Thanks for the effect, me and a colleague spent and hour tearing it apart to understand it… mind-bending. Anyway, gotta say that the way they stole (and continue to steal) your bandwidth was borders on evil, in a “big guy steps on the little guy just because they think they can” kind of way. In response I’ve called for a Boycott of Ajaxian on my blog CodeRenaissance.com. I hope that everyone else that reads this will join me. I call on everyone to unsubscribe from their feeds, block them on twitter, remove links to their site, and to refuse to visit them until they remove the offending frame and publicly apologize. It’s a shame, because this is a cool effect and you deserve more credit and less trouble for your work. There are measures to prevent this from happening again. Put a copyright notice and some blurb about how permission must be requested to hotlink or whatever else you choose at the bottom of each page. Speak to a lawyer if possible, they will be best able to advise you about the specifics. Also, from what I understand of the WIPO Copyright Treaty, Ajaxian have done here should be illegal (articles 6 & 8) and you might be able to take legal action against them. Again, speak to a lawyer. Very well said. Ajaxian should know better. It’s sad that you have to resort to rickrolling to get their attention, and even sadder that they _still_ don’t respond personally. Classless. I’ve unsubscribed from their feed and subscribed to yours by way of protest. I hope this story gets legs. I personally apologize. I certainly didn’t mean to do any harm, in fact I enjoy showcasing your work as it is so great. I was hoping this would be a good thing. I didn’t think through the implications on traffic. It was laziness (I write posts for Ajaxian after hours for the love of it…. often at 2am. I make mistakes). What can I do to say sorry? Buy you a beer? I am going to be in Europe in Feb. Sorry again, and please let me know what I can do. I really appreciate the fantastic work that you do for the Ajax community. Let me get this straight. You show ads through google-syndication on your website. A high-traffic website links to you, people then come to your site to read more, perhaps click on the ads, and you complain about the traffic? Do you have any idea how many people would absolutely love for Ajaxian to link to them once, never mind twice? This isn’t lack of netiquette, it’s how the Internet works. Accept the traffic, the publicity, and move on. I can’t wait to see what you come up with next, and this time I won’t link to anything on your site! @Cary Herman Perhaps you would like to read the post again..in essence what ajaxian did was use his server to process the actual effect but to all appearances people visiting ajaxian will see only ajaxian as the website. Read the post please. That’s not what Román is saying. Ajaxian was using and iFrame, that way showing only what they needed (the effect) instead of linking to the site. Also, by doing this, they were stealing bandwidth, which could take Roman’s site down. And noone could click on the ads since they weren’t actually on Román’s site. And Román: Estupendo trabajo como siempre. Todos tus trabajos me siguen sorprendiendo en especialidad por su originalidad. Felicitaciones por enésima vez. baaaahahhaha. wayyyy better than disabling hot linking. awesome, simply awesome. I just want to say I have deep respect for your HTML/CSS mastery. The effects you managed to build do not only require top-class craftmanship, but also a dose of creativity and ingenuity that I have never seen before. It’s incredibly inspiring, and I am very grateful you’re sharing your knowledge. Thanks, and Kudos to you. I’m glad its sorted but Dion has a history of copying and pasting other peoples content onto his site. I posted comments several times on stories at his site about this and nothing changed. He didn’t do it to me, but to others and I knew as a content creator how frustrating it is. I found it even more annoying that he is a person who really should know better, but for whatever reason just keeps doing it. I’ve seen whole blog posts by others copy-n-pasted up there. He’ll link to the originating site but if the whole article is on his then there isn’t much reason to go on through to the originating site. I’d venture that if you hadn’t Replaced the hot linking stuff then he would have ignored your emails, as is his history. Sure he is nice about it when he ‘has’ to be, but otherwise I think he just doesn’t see what he is doing is wrong. Even the best intentioned people can do wrong things. I like Dion, just hate how someone who is so web focused can not see how doing things like this is so wrong. Wow. I have to say that I knew your work following ajaxian note on the Meninas. I think he’s so intentional he doesn’t cheat anyone. A mistake? If he did it so many times and knows something about the INet you just don’t make this kind of “mistakes”. Dion, you’re a hypocrite to me joking about that beer. Do things right as you know they should have been from the very beginning instead of lying even when excusing yourself! Btw, as Eber said, why don’t U disable hot linking? Roman - it’s great to see you personally involved with your work. But frankly I don’t understand why you require more attention from Ajaxian than that they are already giving you. I mean, they already spend time to keep up with your work and take care to publish you when you have great stuff made out. As for your bandwidth issue - plan for it or otherwise don’t make your work visible. Keep playing and doing great work - your obsession for getting personal contact and permissions for publishing your work is getting in the way. Excellent work, Román. Especially love the Meninas. Too bad about Ajaxian. Folks with access to limitless resources don’t understand those without. They really don’t get it. Que es la vida.